Strong 2" expandable A/4 fabric compartment. To keep all the important documents safe and well organized, you need our cobra files to do the job. These cobra files are the best option to go with when you need to hold a few documents in a file. They come in handy for storing a good number of documents that belong to a same section. You could have all your important documents in a single file for better accessibility. The cobra files are strong and won't bend easily which can tear papers on the corners. For better safety of your papers, you must use these cobra files. You can buy cobra file online from DCGPAC at prices lower than market prices. These cobra files promise better organization of your papers, documents and are also attractive to look at. They are designed in a way which lets you use them one handed which is a very comfortable way to hold and read files. The side slip in design of the cobra file also ensures that we can quickly file our documents without any hassle. They are available in various vibrant colours which make them look visually attractive as well. Cobra files also come with a pocket on the inside cover which helps us store loose sheets in them. This comes in really handy when we are left with loose sheets and have no place to keep them. They also have a full A4 size fabric compartment which measures 2". 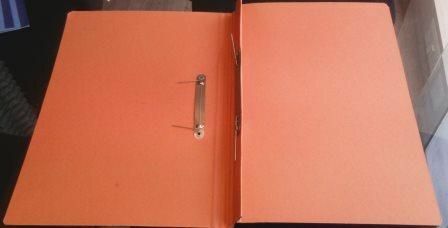 This makes sure that the papers and sheets we store inside the file are safe. The wire prongs to the left hold the springs at the perfect angle so that it becomes easier for you to rearrange and store your documents. The cobra files have a huge capacity of holding around 180 sheets in a single file. DCGPAC offers all its good quality products at the lowest prices possible. You can buy cobra office file online from DCGPAC at extremely affordable prices. You also get the convenience of ordering them online and saving your money. Order it now to get it quickly delivered at your doorstep.